Scientists from IISC have found that building wind farms is exactly like introducing a new predator species in an ecosystem. Wind farms are considered environmentally friendly option for generating electricity. About 8 percent of the power in India is generated using electricity. Researchers from the Indian Institute of Science, studying the ecological impact of the wind farms found that there are far reaching consequences of these windmills. The ecological impact is on many levels. The blades of the wind mills directly strike birds and bats, and disrupt the migration routes of birds. The number of predatory birds reduce where wind farms were located. In the same plateau in the Western Ghats, the researchers studied predatory birds such as hawks and kites, at locations with and without wind farms. Predatory birds were far fewer in the locations with wind farms. Further, the birds were in the vicinity of wind farms, made fewer attempts at capturing prey, and displayed a reduced frequency of dives. 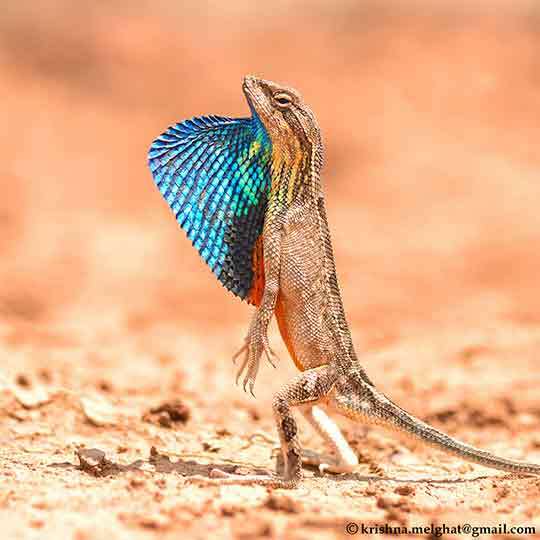 Consequently, there was an increase in number of the prey species of these birds, the fan throated lizards. The disruptions in the ecosystem go beyond just interfering with the natural numbers of the predator and prey species. The lizards in the areas wind wind farms did not behave like they were a prey species at all. The scientists tested this out by conducting mock predation attempts on the lizards. In the areas with wind farms, the lizards allowed the humans to approach much closer than the areas without wind farms. This was because of the reduced stress from predator species, where the wind farms were located. The population of common lizard species has ballooned to three times the regular amounts, in locations with wind farms. However, that increase has negative consequences of its own. Wind farms are not exactly paradises for lizards. As there is increased competition in the prey species, the total available food for each individual in the population has gone down. This means that the lizards in the areas with wind farms are actually less fit and healthy than the lizards that have been exposed to regular levels of predation. The males in the populations near wind farms had dull colouration, as a result of not having adequate food. The reduced brightness could interfere with the sexual selection in the population. What is happening here is known as a trophic cascade. These are widespread changes through the food pyramid, which occurs when a new prey or predator species is introduced to an environment. The windmills are essentially playing the role of a new apex predator in the region, disrupting the natural predator and prey populations in the area. In a study that spanned 40 years, researchers studied the ecological impact of wolves disappearing from Yellowstone National park, and how reintroducing them helped improve the forest. An example of a bottom up trophic cascade is the dying out of insects in the rainforests, due to climate change. This is the same as wiping out the bottom of the food pyramid, affecting all the animals on the higher trophic levels. So, what does the study tell us? Wind farms have far reaching ecological consequences, which we are only beginning to fully comprehend. So far, these consequences had been heavily underestimated. When setting up wind farms, we have to ensure that biodiversity hotspot and sensitive ecozones are not adversely affected. It is not a good idea to set up wind farms in the migration routes of birds. When building wind farms, it is necessary to have environmental considerations as well, and not just economic ones.